I am happy to report that Philadelphia Magazine is featuring one of my latest projects in this month’s issue. Check out the complete home tour here. I have come to think of this home as the “archetypical” Philadelphia row home, only reimagined and reinvigorated to accommodate the needs and lifestyle of a young center city family. When I completed this Queen Village project earlier this year I knew it would be relevant and interesting to many urban dwellers who love the character and charm of an older home but have difficulty figuring out how to make living in one feasible. Philadelphia is a city blessed with a multitude of historic architectural buildings and many of its streets are lined with vertical, long, attached houses commonly referred to here as “row homes.” Many of these houses, some built as far back as the 17 and 18 hundreds, are known for their majestic exteriors, tall ceilings, and ornate moldings. They are also known for being pretty impractical for 21st century living. Maneuvering strollers and bicycles in and out of their front doors can resemble a Cirque du Soleil act. Kitchens can be cramped and closed off from the other rooms, making daily family life a struggle. Try cooking dinner, monitoring homework, and making sure a younger child, who is out of view, isn’t getting into some kind of trouble in a neighboring room. And forget about storage space. Rare is the row home that has a foyer closet for all of our boots, gloves, coats and hats, let alone enough bedroom closets to fit much more than a half a season worth of clothes. Last year I was approached by a young couple with twin toddler girls who were committed to staying in the city but needed to make their recently purchased home work for them. I set out to rethink the space entirely, make smart decisions that didn’t break the bank, and devise proactive solutions that would allow them to stay in the house for many years. 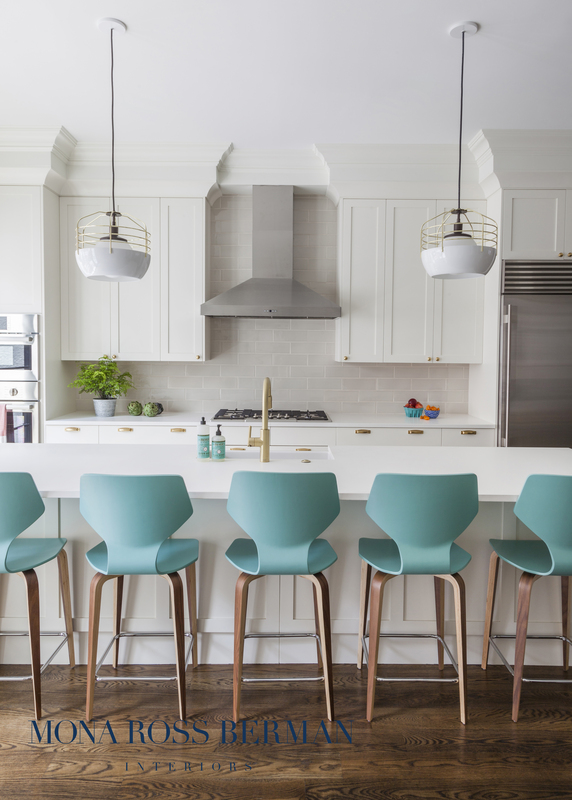 It was clear from the beginning that the kitchen and powder room needed an overhaul and that we all wanted to create more of an open living floor plan on the first floor. We also decided to open up the entire back of the house with floor to ceiling windows, add a separate entry room with ample built in storage, rework the floor plan on the second floor to make space for a home office plus a full bath, laundry room, and three (yes three!) bedrooms, and shrink the footprint of the over-sized, poorly laid out master bedroom to accommodate a large dressing room and an expanded master bathroom. We also added wood paneling to the living room, foyer, and staircase to help better define and enhance those spaces. Once we sorted out these architectural and structural changes, the furnishing of the house came together relatively easily. We had already conceived the spaces with specific furniture and needs in mind. It’s always preferable to do that whenever possible. I find spaces are significantly more successful when they are planned as a whole rather than piecemeal. We also added some fun wallpaper in a few key spots, kept materials like tile and countertops simple and fun, and splurged in a few places like the custom cabinetry, millwork, and window treatments. Our clients have been enjoying their new home and even welcomed a third child over the summer – thus putting this reimagined row home immediately to the test!